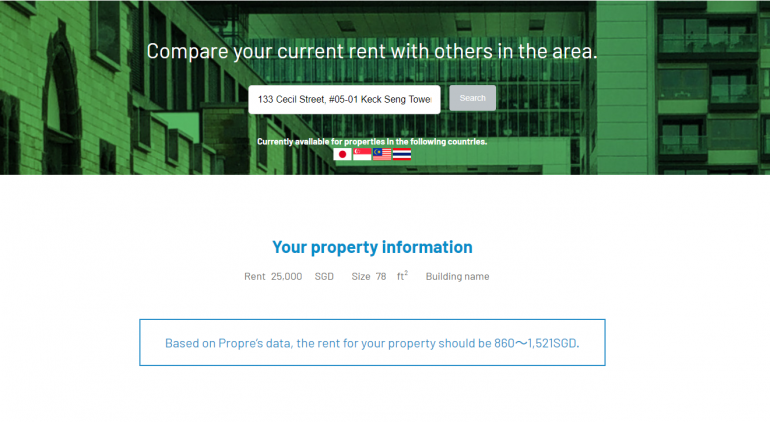 Propre’sRent evaluation calculates appropriate rent prices by analyzing real estate data. 1) Is my current rent cheap or expensive? The longer you live in one place the more you start to worry whether the price you agreed to pay in your contract is different from the current prices in the surrounding area. In this case, please use Propre’s rent assessment service to find a rental price that is appropriate for your current residence. 2) What rental price will attract tenants? We want to help the property owner by setting the price as high as possible however, an overpriced property will simply drive away tenants. In this case, find a competitive price for your property by referring to Propre’s rent assessment service. 3) What is the yield on this property? Estimated rental income is very important when making investments in real estate. Use Propre’s rent assessment service so that you don’t find yourself without tenants for a property you have already purchased. Propre currently offers rent assessment in the following four countries: Singapore, Japan, Malaysia and Thailand. We will continue to increase the number of countries we offer this service to in the near future. This service is available to anyone and no membership registration is required.